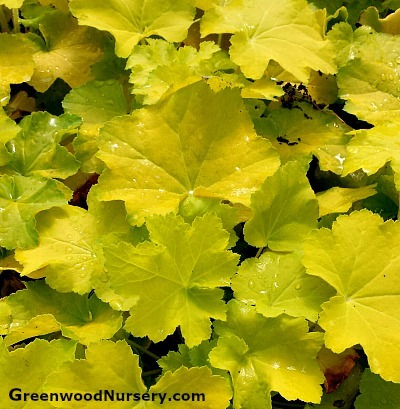 This heat and humidity tolerant heuchera maintains its beautiful chartreuse or lime yellow foliage throughout the growing season. Maturing under a foot tall, this coral bells variety provides amazing contrast in any garden setting. From partial sun to dapple shade, plant this stunner in garden borders and woodland gardens. A North American Native perennial plant. Care for Heucheras: Prune in spring. Water weekly through growing season. Fertilize regularly for best growth. Divide clumps every 3 to 4 years to prevent overgrowth. Citronelle Heuchera ships as a one gallon container grown plant. Orders shipping to CA and AZ may be bare rooted before being prepped for shipping.